The link between periodontal disease and tooth loss is well known, but did you know that recent studies have also shown a link between periodontal disease and cardiovascular disease? Periodontal disease (PD) is an infection of the gums caused by plaque buildup. Most often caused by poor brushing and flossing, plaque is made up of a sticky film of bacteria that builds up and hardens on the teeth, causing gum inflammation, sore and bleeding gums, chewing problems, and even tooth loss. Risk factors for PD include improper oral health care and smoking. 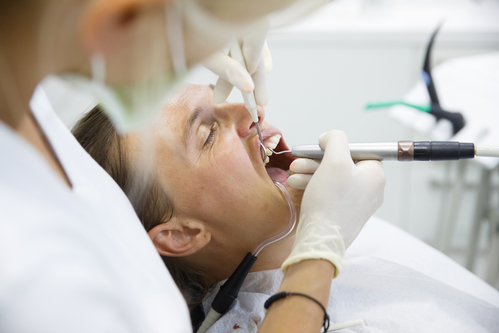 Although a concrete cause and effect connection between the two disease has not yet been found, researchers have discovered that a high percentage of people with cardiovascular disease also have periodontal disease. Studies have also shown that PD can exacerbate existing heart conditions. So what’s the link? Scientists have found that the same bacteria in periodontal pockets also exist in the arterial plaque found in cardiovascular disease. Their findings also suggest that periodontal bacteria can enter the bloodstream during daily activities such as eating and brushing, which increases the body-wide inflammation that contributes to cardiovascular disease. Brush after meals or at least twice a day with a soft-bristled toothbrush and a fluoride toothpaste recommended by your dentist. Be sure to brush your tongue as well to clear out the bacteria that loves to hide there. Flossing at least once a day removes food particles and plaque between teeth. Make sure to floss between and around each tooth, including those in the very back of your mouth. Using a dentist-recommended mouthwash after brushing can help reduce plaque and remove any leftover food particles that brushing and flossing may have missed. Age, smoking, diet, and genetics can all increase your risk for PD. If you have increased risk, talk to your dental care professional. Schedule twice yearly cleanings and make sure to contact your dentist as soon as possible if you begin to exhibit any signs of periodontal disease. It is also recommended that you get a comprehensive periodontal evaluation (CPE) once a year. A CPE is a thorough examination that looks at your teeth, plaque levels, gums, bite, bone structure, and other risks for periodontal disease. Early detection and treatment is key to protecting your mouth and your entire body. Have concerns about your periodontal health? Pointe Dental Group has two offices staffed by highly trained oral health professionals, including certified periodontists in SE Michigan. Contact us at the location that best serves you with any questions you have. We are here to help! This entry was posted in Periodontal Disease and tagged Periodontics. Bookmark the permalink. Follow any comments here with the RSS feed for this post. Both comments and trackbacks are currently closed.